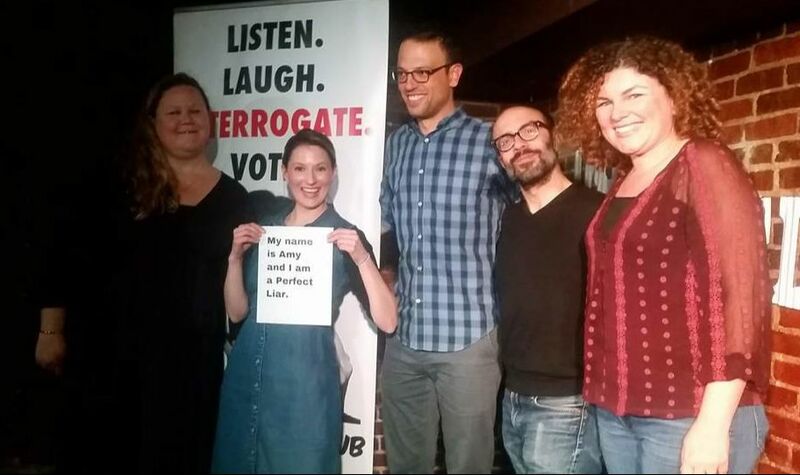 Post-election hangovers and autumn's bitter chill did little to prevent scads of DC's best and brightest from descending upon Dupont Circle's legendary Bier Baron Tavern and DC Comedy Loft for the November installment of Perfect Liars Club. Awaiting the capacity crowd was a cadre of four fabulous tale tellers -- one show veteran and three first-timers -- each offering up incredulous tales of travel, trial, and best-laid plans that went very much awry. Was Londoner Rebecca's off-the-grid jungle getaway disrupted when she learned the news of Princess Diana's untimely passing from locals? Did New Yorker Mark attempt to overcome his lifelong fear of flying by booking an18 hour flight from JFK to Johannesburg? Did Norwegian Forest Cat breeder Amy's foray into the world of cat pageantry hit a sour note when she was disqualified from a cat show for violating competition rules? Did self-proclaimed "Flying Dutchman" Yoav's Israel hiking adventure take a turn for the worse when he tumbled off the side of a mountain and wound up in the hospital with multiple fractures? As the last story came to a shocking close and a brief intermission began, the performance hall was filled with the dull murmur of the crowd's apparent indecisiveness. Unlike shows past, no clear suspect had emerged. Had our storytellers stumped the gallery? Would the interrogation bring some much-needed clarity to the fence-straddling herd? Time would tell. Could Rebecca explain how the jungle-dwelling locals powered the television that served up the tragic news of Lady Di's passing? Could Mark name or describe any of the people who sat next to him on his marathon overseas flight? Could Amy demonstrate the proper way to brush a Norwegian Forest Cat's coat? Could Yoav identify his chosen footwear for the ill-fated mountain excursion? Despite 30 minutes of intense Q & A, no frontrunner fraud materialized. And as audience members were given a moment to mull who among the storytellers would receive their vote, the dull murmur of indecisiveness came roaring back again. Ultimately, the majority of the audience concluded that Mark was the liar, followed by Amy and Yoav, with Rebecca pulling up the rear. But were they correct? Had they succeeded in spotting two liars in a row? The drum roll sounded. Anticipation reached a fever pitch. And November's Perfect Liar bounded before them, another liar unspotted.